Are Plasma TVs Still Alive? LG and Panasonic are trying to revive plasma displays. CRT TVs. Laserdisc. VHS. Beta. CED (bet you have to look that one up). All of these once represented a state-of-the-art technology, but have since made their way to that big home theater in the sky. 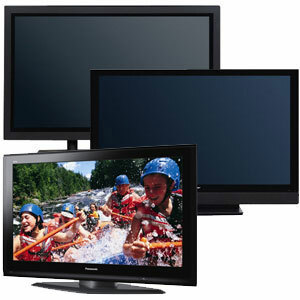 Many consumers think plasma displays also are dead, or are on their way out. But plasmas shouldn’t be relegated to the book-ends of the display market just yet, at least not as far as LG Electronics and Panasonic are concerned. Panasonic will release more than 20 models, including four 3D-capable TVs that range from 50-65 inches. The 3D sets, which won both “Best In Television” and “Best In Show” at CES 2010, will include one pair of 3D glasses. Other features include THX certification, NeoPDP picture enhancements, and Viera Cast network streaming. Plasma won’t take back the middle of the flat-panel TV market, but it will look to continue to be the meat of many high-end display lines and an important part of the push for 3D in the home. Some two-fer releases and some good titles you may have missed in the theater highlight this week’s new Blu-rays. Director Steven Soderbergh has a pretty good track history. So does actor Matt Damon. 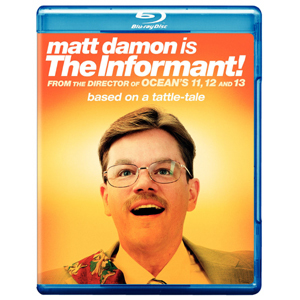 So how is it that so many people missed out on The Informant! when it was in the theaters? Whistleblower movies are always entertaining and informative, and this one seems like it would make for good viewing. Maybe not as gritty as The Insider, but a good look at big business nonetheless. It’s based on a true story. Another lesser-known screener is about a big-mouthed football manager – football as in soccer – in the demanding English Premier League. It’s called The Damned United, a dark comedy about the brief tenure of the manager of reigning champ Leeds United. Should be a must-see for sports fans, and with the screenplay by Peter Morgan, who also wrote The Queen and Frost/Nixon, it should be engaging for most viewers. If it’s horror that you’re after, take a gander at George Romero’s The Crazies. Yup, same tale as the movie you’ve seen advertised on TV a bunch lately, except this is the original from the master zombie movie director, with stark grit as only early 1970s horror can provide. Also this week several two-fer Blu-ray offerings will hit shelves. You can double-dip on Chevy Chase (Funny Farm/Spies Like Us), Harrison Ford (Presumed Innocent/Frantic), Sandra Bullock (Miss Congeniality and sequel), Clint Eastwood (Dirty Harry/Magnum Force), De Niro/Crystal (Analyze This/Analyze That) and Grumpy and Grumpier Old Men. For classical music fans, there are also a slew of classical and operatic releases this week for your listening pleasure. 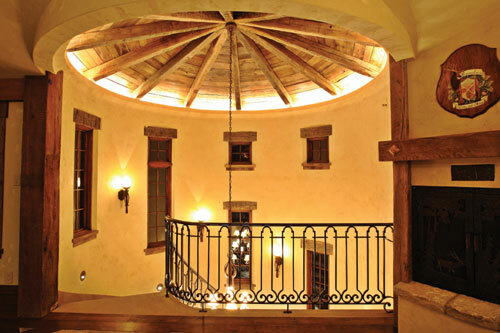 Examples of how cookie-cutter lighting control solutions can’t cut it. The lighting requirements of every homeowner are unique. Cookie-cutter lighting control solutions just don’t cut it anymore. We collected some of our favorite lighting control installs, including a Super Bowl MVP, Rock and Roll Hall of Famer and quirky product inventor. So whether you’re adding lighting control yourself or with the help of a CE pro, here are a few ideas to get your brain pumping. A little lighting control goes a long way toward simplifying life in this 17,000-square foot home. The hallway lighting brightens gradually to preset intensity levels at the touch of a button tied into the Crestron automation system. An “Entertain” scene adjusts the brightness levels of select lights to accentuate the home’s unique architectural features, while also opening the motorized draperies to provide a view of the mountains from the floor-to-ceiling windows. A “Good Morning” scene switches on fixtures in certain rooms. A “Goodbye” scene sweeps through the house to ensure that every light is turned off during the owners’ absence. “Goodnight With Guests” switches off every light except for the fixtures in the guest suites and hallways. Segway inventor Dean Kamen owns a lighthouse home on the North Dumplings Island. 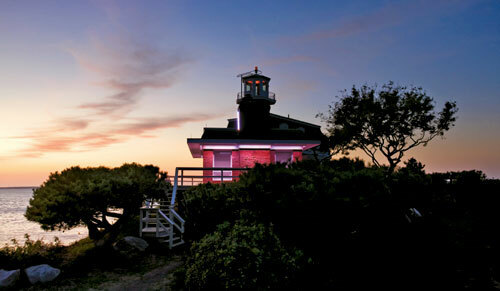 A couple of years ago, the U.S. government cut the undersea cable that powered the lighthouse, forcing Kamen to rely on solar panels to power his home. Philips Color Kinetics, makers of LED, helped Kamen with his goal “to design and build the world’s neatest home lighting system.” An LED Light System Manager from Philips now controls the island’s color LEDs and can modulate each bulb to control brightness, generate different colors from the red, green and blue LEDs. It took more than just pretty lighting effects for this Hollywood Hills home to win Electronic House’s Home of the Year. 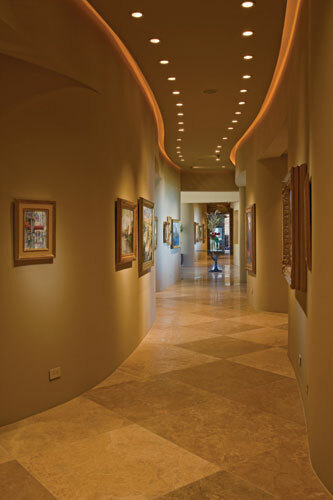 A Vantage lighting system, controlled by Crestron automation, includes various scenes that light up or accent specific areas of this 7,000-square-foot residence. It provides both practical and architectural enhancements. This was an enormous LED retrofit – to the tune of about $60,000 worth of energy-saving improvements. “Everything about the project was big,” says Mark McGuinness of Chesley Electric in Park City, Utah, of this 16,500-square-foot home that recently won Lutron’s Excellence Award for Best Green Project. A big portion of the savings came from Chesley replacing all the system’s halogen lighting, inside and out, with LEDs from LED Power. Adding LED bulbs in a dimmable lighting control system is not an easy trick. The Lutron HomeWorks system is able to dim the 300 or so MR16 lights, but not the recessed PAR lamps. So Chesley programmed the lighting control system to shut off the PAR lamps during certain dimmable scenes. For example, in the kitchen, when a SOFT scene button is pressed, the MR16s over the cabinets dim, and the six receding PAR lamps shut off. It’s not always easy to navigate a 12,000-square-foot home, so Shelton, Conn.-based Advanced Home Audio provides some trails. A connection between a Vantage lighting control system and AMX home control system allows the family to brighten, dim and turn on and off more than 200 interior and exterior lights. Pathways, which illuminate a route between rooms, can also be engaged from a touchpanel. The system maps out a course to the destination automatically, based on where the user is. For example, if the user activates the “Movie” path from the kitchen touchpanel, lights leading from the kitchen to the home theater switch on. 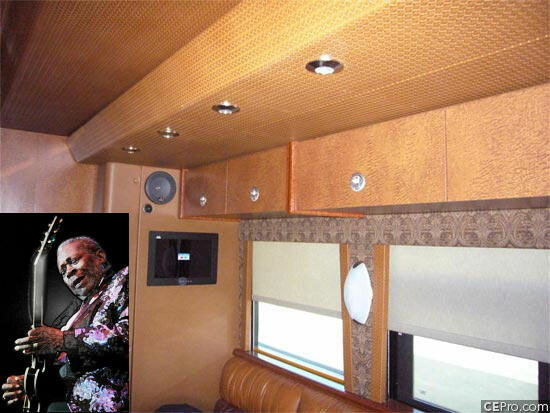 When you’re an 84-year-old blues legend who still loves performing enough to tour the country, you deserve nice accommodations. So it’s good that B.B. King’s $1.4 million, 45-foot luxury motor coach with more than $200,000 worth of electronics includes some solid lighting control. It uses a proprietary 12-relay lighting control system that was designed by Digital Home Lifestyles, which controls the 64 zones of lighting. 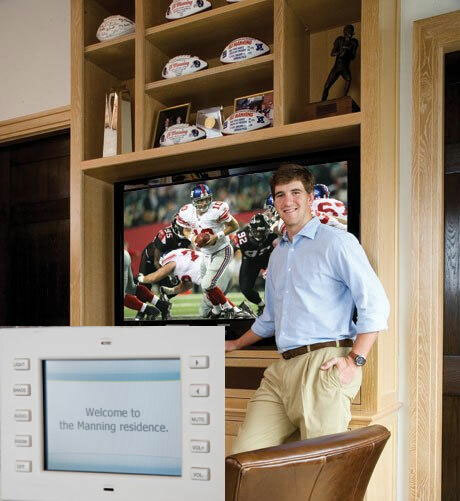 Total home control was Eli Manning ‘s overwhelming priority when the Mannings gutted and renovated their 3,000-square-foot condo. Eli and his wife wanted one-touch control of audio, video, motorized shades and lights. The couple worked with Audio Video Crafts, using both Lutron and Crestron components to design the system.